Herb Roasted Potatoes are utterly amazing and delicious! This simple side dish goes perfectly with so many dishes. These easy roasted potatoes will be your go-to potato recipe for every meal. We kept the seasoned potatoes simple, with just potatoes, olive oil, and herbs. The BEST Herb Roasted Potatoes recipe for all occasions! Herb Roasted Potatoes are simple, tasty, and full of flavor. These seasoned potatoes are the perfect side dish for any meal! Herb Roasted Potatoes are one of those must-make recipes that will be a staple for your family from the moment you make it. These easy roasted potatoes are seasoned to perfection, SO easy and quick to make, and go with literally EVERYTHING. Burgers, chicken, steak, pizza….well maybe not pizza…but you get the idea. These delicious seasoned potatoes are incredibly versatile and they are a hit among both kids and adults. If I can’t decide on a side dish to make with dinner, THIS is what I end up making. It’s my go-to potato side dish recipe because it’s just so good. We always make extra roasted potatoes, because they’re very addicting. Trust me. You won’t be able to stop eating them. You can turn this recipe into garlic roasted potatoes, rosemary roasted potatoes…whatever herbs and spices you like, you can add those into this herb roasted potatoes recipe! 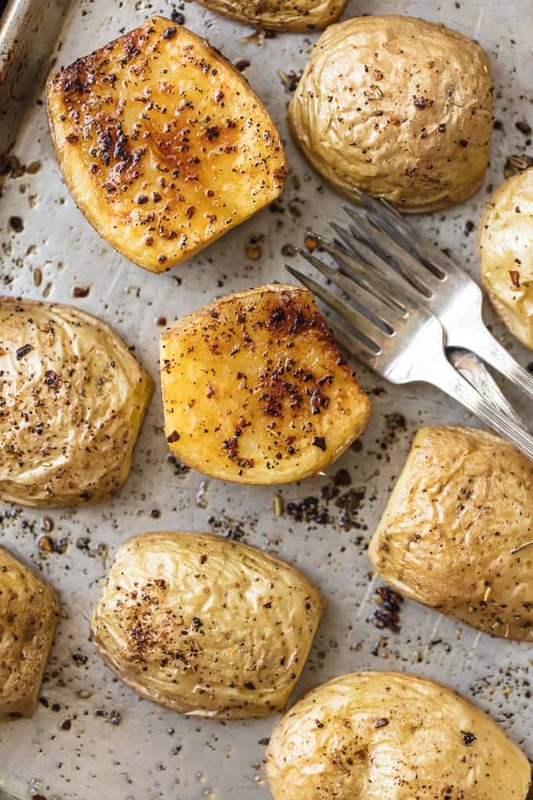 Make the best Herb Roasted Potatoes for every meal. These simple seasoned potatoes go with EVERYTHING! I love this easy seasoned potatoes recipe because it’s versatile. It’s really just the basics of how to roast potatoes in the oven in the most simple way, and you can add whatever herbs or seasonings you like best. Make garlic roasted potatoes, rosemary roasted potatoes (two of my favorite seasonings), or even just good ole’ salt and pepper. These herb roasted potatoes come out of the oven so full flavor, with the perfect level of crispiness. I love how olive oil and a couple of herbs is enough to create the perfect side dish! And you can change it up every time you make these herb roasted potatoes to try something different. Sometimes coming up with a side dish to make with dinner can be the toughest part. You’ve got your main all figured out (oven fried chicken, Parmesan pork chops, spinach stuffed chicken), but you just don’t know what to serve with it. These easy roasted potatoes are a life saver for me because they are so easy to make and they go with everything! Any time I’m struggling to think of a fun good side dish, I just go straight to these seasoned potatoes, because I know they won’t let me down! What herbs go well with roasted potatoes? 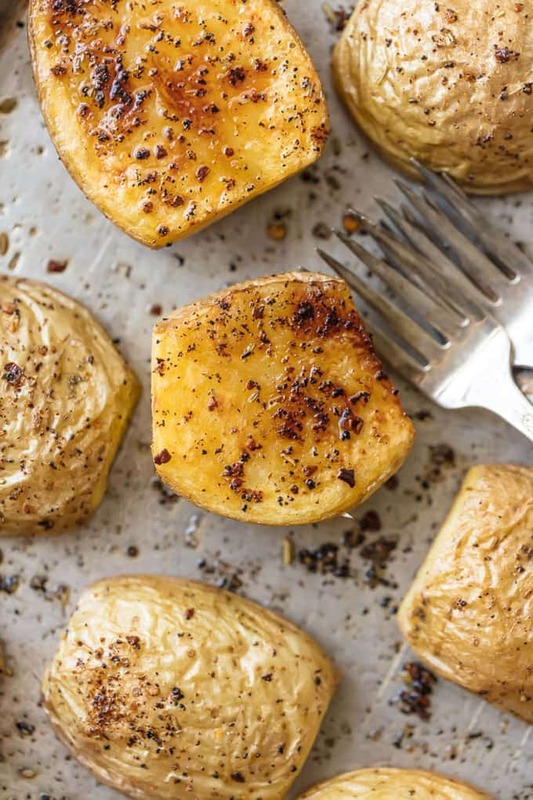 Any herbs and spices can be used with this easy roasted potatoes recipe. I prefer rosemary, garlic, and thyme, but you can use any herbs, spices, or seasonings you like. Use basil, parsley, a bit of butter, paprika, curry powder, cumin…absolutely anything! 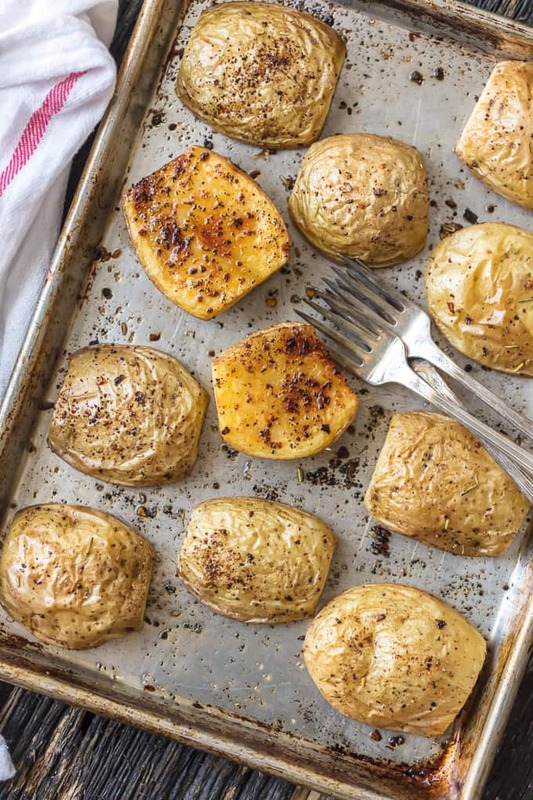 Which potatoes are best for oven roasting? Yukon Gold potatoes are great for roasting, and that’s what I used for this herb roasted potatoes recipe. This easy roasted potatoes recipe is as simple as can be! Potatoes, olive oil, herbs. That’s all you need to make the best herb roasted potatoes, and that’s why I love making this side dish for every meal. Easy seasoned potatoes for every meal! I’d be happy eating these easy roasted potatoes every night of the week with a different main course. 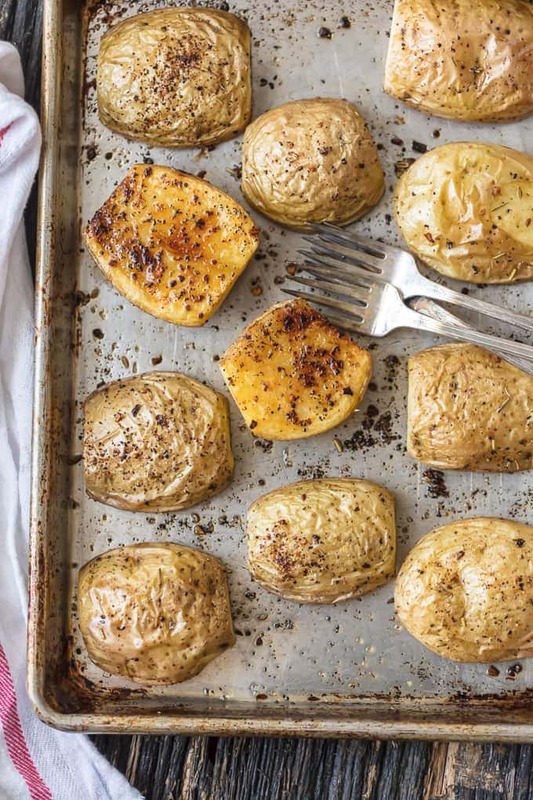 The flavor and simplicity of seasoned potatoes would never get old! The way the herbs caramelize on one side while the other side crisps. WOW. You’re going to really love this herb roasted potatoes recipe, especially for Thanksgiving and other holidays. It may not be a traditional holiday side, but it really would be a delicious addition to your Thanksgiving or Christmas table. See the recipe card below for details on how to make Herb Roasted Potatoes. Enjoy! 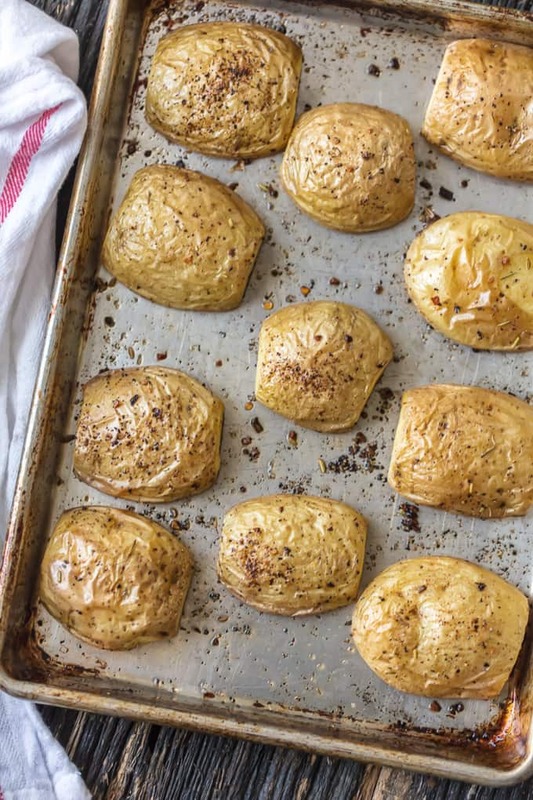 These BEST HERB ROASTED POTATOES are utterly amazing and delicious. This simple side is perfect with so many dishes. This will be your go-to potato recipe! Preheat oven to 400 degrees F. Cover a baking sheet with aluminum foil and brush the foil with oil. With paper towels, pat dry the potato halves. Place all ingredients in a large bowl. Gently mix until the potatoes are evenly coated. Place potatoes, 1-2” apart, flat-side down, on the prepared baking sheet. Place potatoes in the preheated oven and cook at 400F for 35-45 minutes or until golden on the bottom side and soft inside.